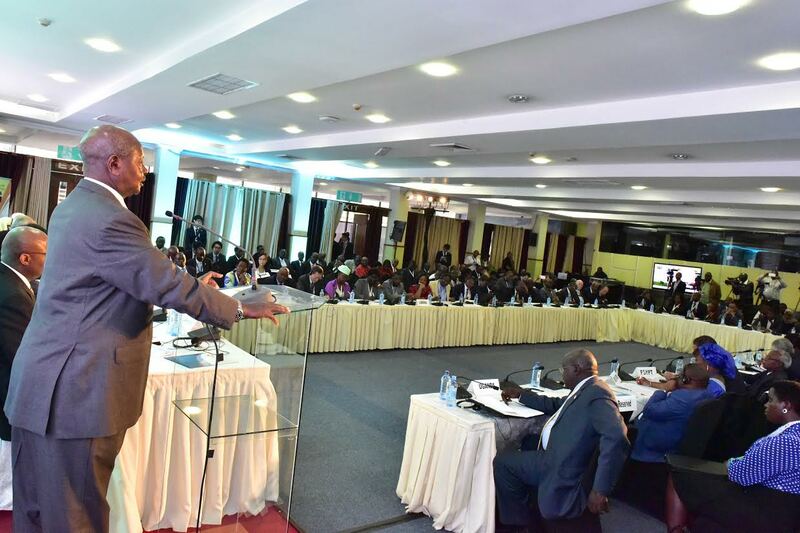 Museveni addressing African leaders in Nairobi recently. One of President Yoweri Museveni’s glaring intellectual weaknesses is the tendency to use concepts carelessly. We have seen this numerous times in his use of ideology. He has also used the concept underdevelopment carelessly to a point of turning the concept into a meaningless thing. My attention on this matter has been drawn by his recent use of the concept at the African Peer Review Mechanism (APRM) in Nairobi on August 26 2016. At that meeting President Museveni is reported to have delivered a paper on 10 bottlenecks to Africa’s growth and development. Much as President Museveni’s paper was adapted as a working paper to guide the conversation on the continents problems, and probably because of that, this flaw needs to be pointed out. Pointing it out may even help the APRM secretariat which has been assigned to expand President Museveni’s paper into a blueprint for Africa. In his paper, President Museveni is reported to have argued that underdevelopment of infrastructure is the fourth bottleneck. According to him development partners are not interested in building Africa’s infrastructure, and especially electricity. As though to deliberately demonstrate his ignorance of the concept underdevelopment, President Museveni also talked of the underdevelopment of human resources. The use of the concept underdevelopment to describe the state of infrastructure or human resources is a serious misnomer. The concept underdevelopment first emerged in the 1950s as an aspect of a critique of Keynesian and neo-classical interpretations of economic development in the countries then attaining independence. The man credited with distilling the concept as well as the theory behind it is Paul Alexander Baran. Baran was an American Marxist economist. In 1951 he was promoted to full professor at Stanford University and was the only tenured Marxian economist in the United States until his death in 1964. This was an extremely unique achievement considering that this was the McCarthy era when anybody with a communist leaning would be hunted down. Baran also worked very closely with Paul Sweezy to produce the famous Marxist periodical, Monthly Review. The duo also wrote the book, `Monopoly Capital’ which developed the theory of underdevelopment even further. The theory of underdevelopment is based on the notion of economic surplus, and the generation and utilisation of the surplus within the capitalist economic system. In his book, `The Political Economy of Growth’ – first published in 1957, Baran defined the economic surplus as “the difference between society’s current output and its current consumption”. This surplus, Baran, theorised is either invested in production to increase output, used for speculation, invested outside the economy that produced it, or hoarded. Baran drew a serious distinction between the ways the surplus is utilised in two sets of economies. In the developed capitalist economies, he pointed out, an ever increasing surplus; which eventually fails to get investment outlets, gets generated. On the other hand, in the peripheral capitalist economies (or underdeveloped countries) such as Uganda, whatever surplus is generated, gets siphoned out in terms of repatriation of profits, and elites of underdeveloped countries taking whatever they will have stolen out of the country. More recently some successful companies from the third world have started investing whatever surplus they accrue in their respective countries in the developed capitalist countries. We have seen this in the case of some successful Indian companies going to Britain and buying out motor car manufacturing companies as in the case of Land Rover and Jaguar. The Chinese nouveau riche are also buying a lot of real estate in the U.S. Thus, Baran argued, the problem is not so much of a lack of development, but an underdevelopment of the economy; an undermining of its potential for development due to the appropriation of investible surplus which could have generated and sustained development. Baran’s notions are reinforced by Prof. Andre Gunder Frank who combines the concepts of surplus absorption and utilisation with a model of the world economy based upon the division of the world economy into two complementary parts of the metropolitan sector of the economy, on the one hand, and the satellite sector on the other. According to Gunder Frank the metropolitan sector of the world economy does dominate the satellite sector through the expropriation of their surpluses, a factor which is a result of the imposition of an export-oriented capitalist development. To Gunder Frank alleviation of underdevelopment can only come about during periods of retreat or withdrawal of the developed capitalist countries from the expropriation of the surplus of the peripheral capitalist countries. This is because underdevelopment is always a result of the expropriation of the economic surplus of the peripheral capitalist economies.